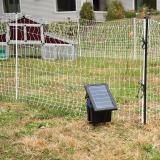 Solar powered 0.60 joule fence energizer. 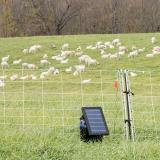 Portable all-in-one unit arrives ready to power electric fence or netting. 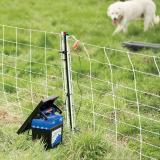 IntelliShock® electric fence chargers are able to reduce energy demand when the fence’s voltage is high–due to fewer weeds touching the fence. This occurs in fall and winter for most fences and occurs all year for some horse, cattle and deer fences. 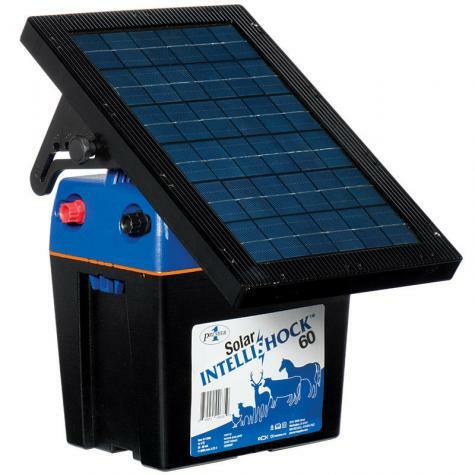 As a result, an IntelliShock unit’s battery is more likely to remain charged through the low sunlight days of autumn and winter. 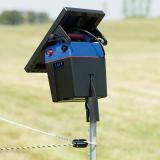 Note: Kit includes a 5-Light Wireless Fence Tester. 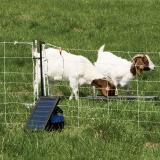 A solar powered energizer often used with electric fences to contain sheep, goats, poultry, swine, cattle and horses. Effective against predators such as coyotes, stray dogs, bears and foxes. Can also be used with garden and wildlife fences to keep out deer, raccoons, woodchucks, rabbits, opossums and skunks. 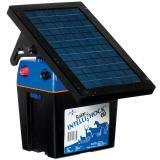 Solar powered energizers are a popular choice when 110V power is not easily accessible. Attached solar panel will recharge the battery on sunny days. 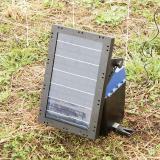 Solar panel is easy to adjust for seasonal light availability. Included step-in ground stake can also be used to support energizer. Easily accessible fence and ground terminals. Fence and ground wiring harness included. 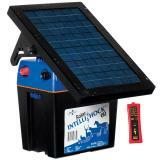 ​The Solar IntelliShock® 60 fence energizer may be operated without a battery and plugged into a 110V power source. See instruction manual for details. Large capacity battery for increased life during long periods with low sunlight. Highly visible on/off light with low battery indicator. Won’t rust. Made from durable UV-treated polycarbonate. Note: Kit includes all of the above and a 5-Light Wireless Fence Tester. Note: The U-Spike ground stake is shipped inside the energizer case. The wiring harness, battery recharger and user manual are included in the cardboard shipping box. Use included ground U-Spike or use at least a 1' galvanized ground rod. Draw from a 12V battery is 20-58 milliampere (mA) per hour, depending on weed load. 3-5 rolls of electric netting depending on soil conditions and vegetation. 1 mile of 3 strand cattle fence. 1/2 mile of 5-7 strand sheep fence. All distances are dependent of grass/weed load on the fence. Open the energizer lid and connect the wires to the battery as indicated on the enclosed sticker. Remove the U-Spike and wiring harness from inside the battery compartment. Step in the ground U-Spike. For added support, you can slide the energizer onto top of U-Spike. Use the wiring harness to connect the energizer to the ground stake and fence. Unscrew the red terminal knob. Secure the bare end of the wire with the orange clip into the hole behind the red terminal knob. Replace the red terminal knob and tighten. Repeat steps #1-3 for the black ground terminal. Connect the black clip to the ground stake. Connect the orange clip to the fence. Check the voltage to ensure the fence is properly electrified before introducing animals. Correct placement of the energizer and solar panel is critical to the best operation of the unit. 1. Position the energizer so that the solar panel faces due south. 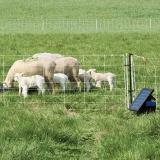 This will allow the panel to receive the maximum amount of sunlight possible even during the low-light days of winter. Consider the sun’s movement throughout the day and avoid placing the unit where it may be covered by shadows from trees, bushes or tall grass. 2. Determine the correct tilt angle for the solar panel. The sun’s position above the horizon will change from season to season. As a general recommendation, an angle of 50° is optimal for the longest use in most areas of the continental USA. However, the ability of the solar panel to recharge the battery can be maximized by making angle adjustments each season as shown in the illustrations below. In the far northern USA from November until February, there may not be enough hours of sunlight to fully recharge the battery. Charge the battery externally when the battery indicator light flashes green/red or red. 3. Regularly remove all debris from the solar panel. This includes grass clippings, dust (especially on gravel roads), leaves and snow as this will reduce the solar panel’s ability to recharge the battery. Using a fence tester, determine the output voltage of the energizer. If the voltage is below 4000V, then the energizer may have a problem. If the voltage is above 4000V, then the trouble lies with your fence or ground system. Test the battery with a Digital Battery Meter or other multi-meter. If the meter reading is greater than 12.5 volts, then check the terminal connections to ensure they are clean from corrosion and fastened tightly. If the meter reading is less than 12.5 volts, then use the included 110V power supply to recharge your battery. See instruction manual for details. Ensure the ground system (rods/stakes) is installed and connected correctly according to the instructions for this unit. If you continue to experience problems, please call us at 800-282-6631. Walk or drive along the fence looking for any point in which the energized wires touch the soil, a steel post, a steel wire or anything conductive. With electric netting, the problem can often be traced to excessive weed load. Starting at the fence charger, measure the voltage as you walk along the fence. If you find a gradual decline in voltage, then you may need to clean away the grass or other debris from the lower strands. If the voltage drop is more rapid, then look for a hot wire touching the metal stake at the bottom of the plastic posts. If the fence can be separated into several parts (by switches or by disconnecting parts of it), you can locate the problem by beginning at the far end and then progressively turning off or disconnecting sections of fence. When the voltage on the remaining fence rises sharply, you've located the section(s) causing the problem. The alternative is to begin at the energizer and progressively turn on sections of the fence. When the voltage suddenly drops you can assume that the problem is in the section most recently connected. Turn off the unit. Disconnecting the unit from the fence is not sufficient, the unit will still pulse unless it is turned off. Clean off the solar panel. Dust and debris may have accumulated during use and as a result prevents the panel from maximum electrical production. When the energizer is not being used, store the unit indoors at room temperature and out of the sun. Do not let the energizer sit in the sun for an extended period when it is turned OFF as this could damage the battery. When not in use, ensure the battery stays above 40% charged. 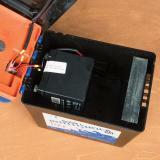 Lead acid batteries don’t work well when they’re left discharged, or at a low charge, for long periods of time. Periodically recharge the battery in the sun or with the included 110V charging unit. Stop charging when the battery indicator light flashes GREEN. Do not overcharge the battery. 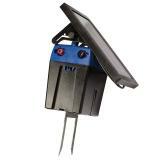 Enables PRS I25/B50/I50 and Solar IntelliShock 30/60/120 units to be mounted onto standard T-Posts or T ground rods. Used to determine when a 12 volt battery needs to be recharged. Touch “+” and “-” probes to the corresponding battery terminals to measure voltage. This meter measures the amount of charge left in the battery—so you know when to recharge. 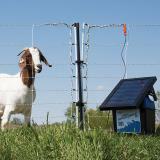 Accurately tests the voltage of an electric fence. Useful for troubleshooting energizer issues too. For instant reassurance that your fence is working. Place permanently on your fence line and simply look for the flash when you pass by. No batteries required. T Ground Rod, 3' x 1/2"
This ground rod features a unique T handle, which makes it easier to grip when removing from soil. 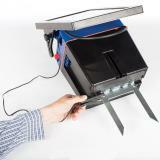 T Ground Rod, 18" x 1/2"
1.5 amp battery recharger to top off your electric fence energizer's batteries. Number of reviews: 47 customers reviewed this product. Recommended: 46 out of 47 said they would recommend this product to a friend. I am not happy with this charger. Its top heavy and the U-spike and the way the solar panel is attached means its hard to move to the next spot. Given that I'm moving them about every two days, I'm getting increasingly annoyed with this energizer after a month-ish. Plus the way it sits on the ground is tripping hazard right at the gate when managing goats vs my previous charger was up out of the way on a T-post that I could rotate pens around 4-6 times before I had to move the post. Its an awkward form factor, no decent handles, etc. Someone else mentioned the instructions about not leaving it connected in the sun but off, that over charging could damage the battery... sounds crazy that there is not a regulator for this, and the form factor design issues with the U spike, solar panel attachment design make it hard to open and unhook the battery leads. On the plus side, it energizes the fence powerfully, seems to work really well, its just a pain to handle and work around it. Seems to work great so far. Very quick to set up and get to work. Awesome! Solar IntelliShock 60 is an amazing unit. Everything I ever hoped and dreamed for. 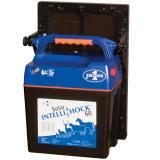 This IntelliShock unit is easy to use. After a few simple assembly steps I was able to put this to use right away. It’s doing a great job protecting my chickens while they work my garden plot. The solar energizer was easy to install and the two-pronged grounding rod that the energizer sits on is sufficient to do the job - no need to get a 6 ft long rod. My use was to build an electric fence around several Crape Myrtles to keep the horses from munching on them so I ran about 250 feet of wire in total. When I was finished I tested the voltage and found that this energizer puts out the same amount as my other 2 mile electric charger - enough to deter man or beast. So far I'm tickled with this unit and perhaps part of the quality is that the energizer is made in Germany, not China.